LTS Microsoft servers have a feature called Shadow Copy. This feature saves backups of previous versions of files on the H and I drives, and also allows backups to occur while files are open. Shadow copy backups are made twice a day at 12 Noon and 7PM. This allows you to restore files or whole folders that have been changed/overwritten or deleted. 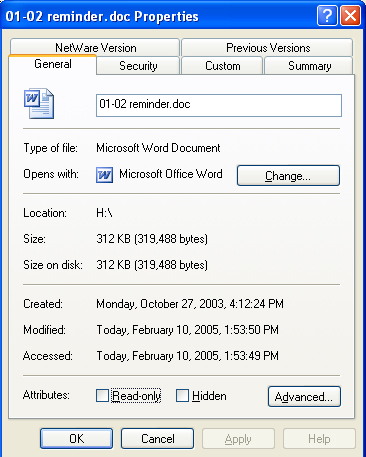 The Shadow copy volume has a limited amount of space and will overwrite the oldest entries when it runs out of room. Files and folders can still be restored from tape backups-- requests for restoration from those backups should go through your Computing Consultant or Margaret Petrovich (83830) in Client Services. This document shows how to restore a file that was overwritten on a LAN drive. To restore deleted files or folders, see Restore a Deleted LAN Drive File. Choose Computer from your Start menu. Double-click the H drive to open it. In your H: drive, find the file you want to restore and right-click it. Choose Properties. In the Properties window, choose the Previous Version tab. There may be one or more previous versions. The Shadow Copy feature gives you the choice to View, Copy, or Restore the files. Restore is not recommended. View: To examine a particular version, select the version and click View; the item will be opened as read-only. 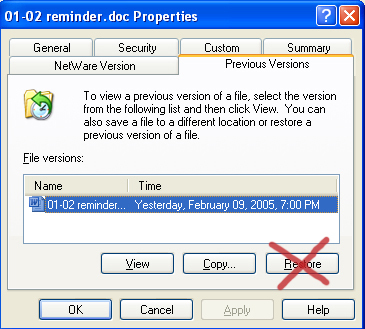 Copy (recommended option): To save a copy of the older version in another location rather than overwrite your existing one, select it and click Copy. Find (and/or create) the folder you want to save it in, and click the Copy button.